The NOAA ESRL Carbon Cycle Group computes global mean surface values using measurements of weekly air samples from the Cooperative Global Air Sampling Network [Conway et al., 1994; Dlugokencky et al., 1994; Novelli et al., 1992; Trolier et al., 1996]. Global values can be computed for nearly all trace gas species and stable isotopes routinely measured by ESRL and the University of Colorado INSTAAR. Here we briefly describe our methodology for computing global mean surface values, illustrated using CO2. The global estimate is based on measurements from a subset of network sites. Only sites where samples are predominantly of well-mixed marine boundary layer (MBL) air representative of a large volume of the atmosphere are considered. These “MBL” sites are typically at remote marine sea level locations with prevailing onshore winds. Measurements from sites at altitude (e.g., Mauna Loa) and from sites close to anthropogenic and natural sources and sinks (e.g., Park Falls, Wisconsin) are excluded from the global estimate. The use of MBL data results in a low-noise representation of the global trend and allows us to make the estimate directly from the data without the need for an atmospheric transport model. All measurements used to estimate surface global means are made by ESRL and CU/INSTAAR (for stable isotopes). Routine and ongoing comparison experiments within the Boulder labs help ensure that measurements are internally consistent with respect to calibration and methodology [WMO, 2009a]. All data used to construct the global estimates have been screened by the principal investigators. Only measurements determined to be free from sampling and analysis artifacts are considered for the calculation of the global estimate. Figure 1 shows all CO2 measurements of samples collected at Ascension Island. 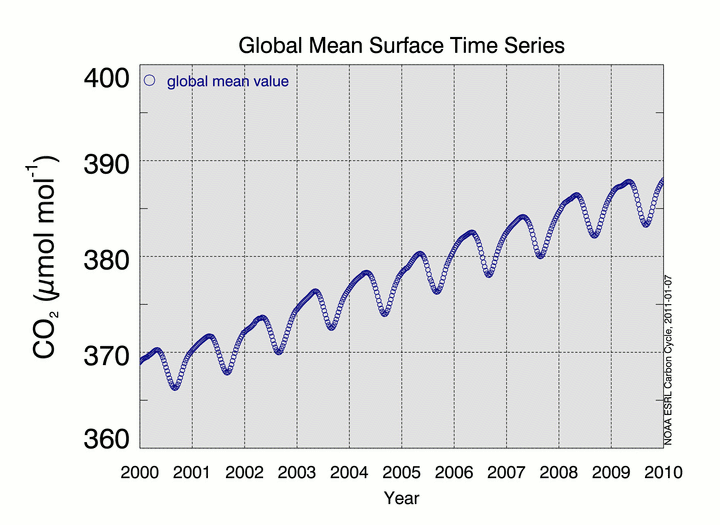 The determination of the global mean surface time series is one of several products derived from the Data Extension methodology, which is described briefly below. A configuration file provides execution details for a specific Data Extension run including the list of designated MBL sites, which may differ for different trace gas species. 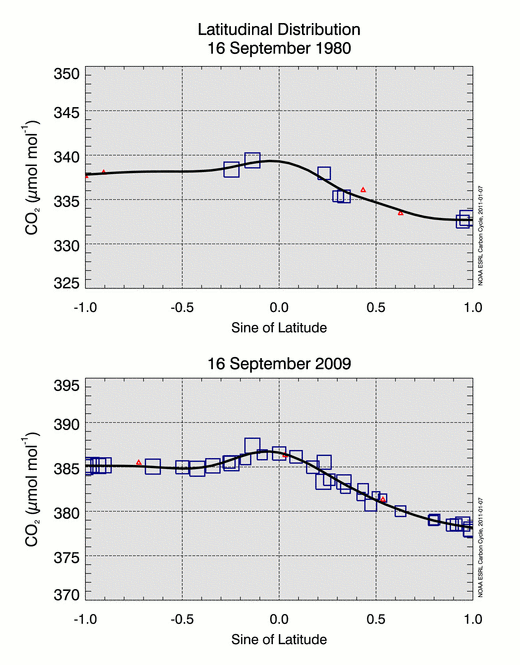 Figure 1: Atmospheric CO2 measurements from samples collected at Ascension Island. Background measurements (shown in blue) are used in the computation of the global average. 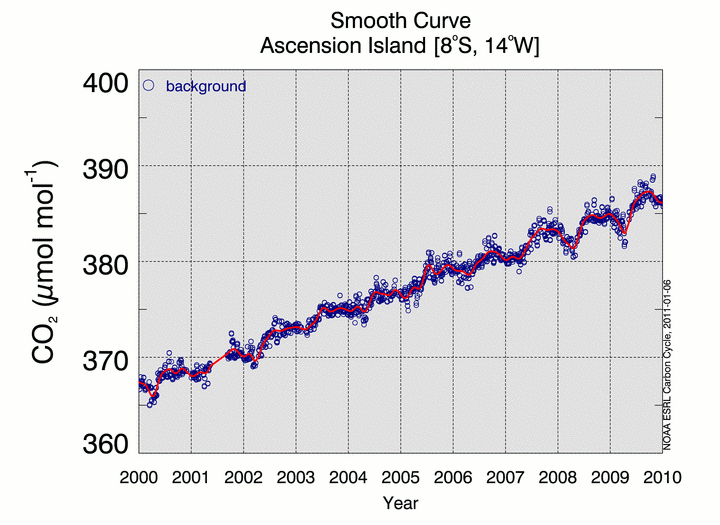 Figure 2 shows the smooth curve, S(t), fitted to background CO2 measurements from Ascension Island for 2000-2009. The curve fitting parameters including number of polynomial and harmonic terms and the FWHM setting are specified for each site in the Data Extension configuration file. Figure 2: Smooth curve, S(t), fitted to background CO2 measurements from samples collected at Ascension Island. We define a synchronization period with 48 time steps per year (~ weekly) for which the global mean surface values will be determined. For CO2, the synchronization period begins January 1, 1979; the ending date depends on the application. We then extract values from the smooth curve where measurements exist and gaps are less than 8 weeks in length. Measurement gaps exceeding 8 weeks are filled using the data-based, data extension methodology described by Masarie and Tans  with important revisions documented in the GLOBALVIEW-CO2 . The data extension procedure produces a set of extended records, which are synchronized in time with 48 “weekly” values per year and have no gaps. 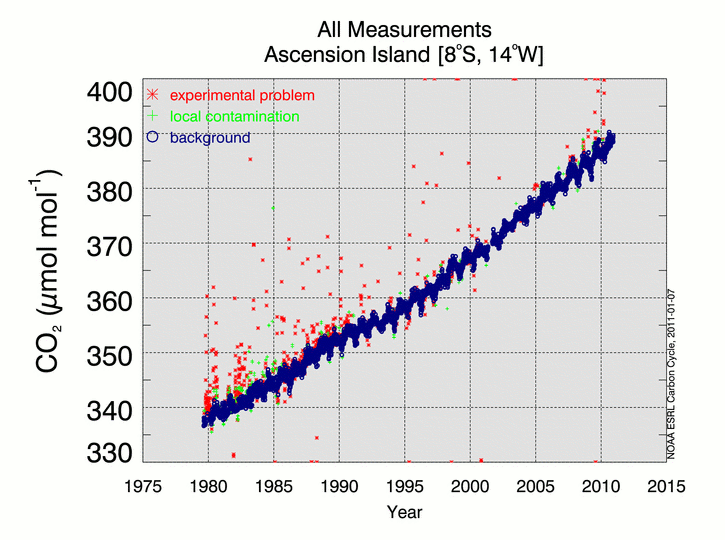 Figure 3 shows the Ascension Island extended record for 2000-2009. 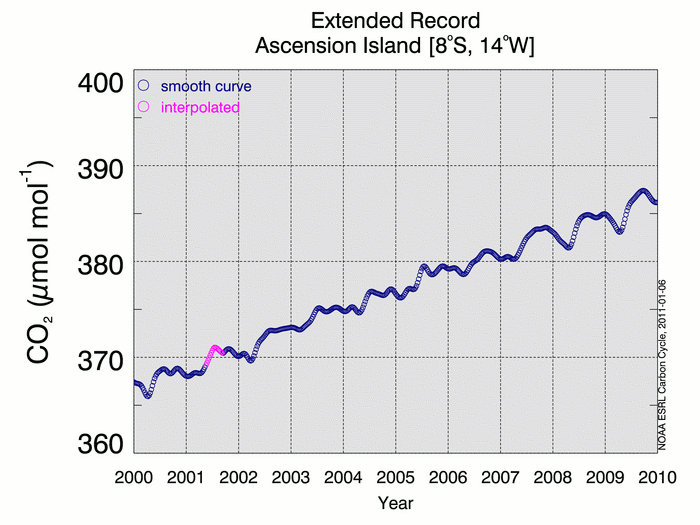 Figure 3: Extended CO2 record for Ascension Island for 2000-2009. Values from the smooth curve (blue) and derived interpolated values (magenta) are shown. For each week in the synchronization period, we construct a latitudinal distribution (CO2 (ppm) versus sine (latitude) using smoothed and interpolated values from the extended records. The number of values available for the distribution can vary weekly due to measurement gaps in records or as MBL sites are added to the ESRL network or terminated. Confidence in values extracted from the smooth curve, SSTA(t), depends on the density of the data, the “scatter” in the data and the length of the measurement period. We use a relative weighting scheme, which assigns greater significance to sites with high signal-to-noise and consistent sampling. Relative weights range from 1 to 10 where the minimum weight of 1 is reserved for all interpolated values. A curve is then fitted to each weekly weighted latitudinal distribution. Details of the latitudinal fitting process are described by Tans et al. . Figure 4 shows the fit to the latitudinal distributions for 16 September 1980 and 2009. Figure 4: (top) Latitude distribution from MBL sites for 16 September 1980. Open blue squares represent values from the smooth curve. Open red triangles are interpolated values derived using the Data Extension methodology. The linear size of the symbol indicates the relative significance of the value. (bottom) Same but for 16 September 2009. Values are extracted from each weekly latitudinal fit at intervals of 0.05 sine of latitude from 90°S to 90°N and joined together to create a 2-dimensional matrix (time versus latitude) of CO2 values. We can then construct a three-dimensional representation of the global distribution of atmospheric CO2 as shown in Figure 5. Figure 5: 3-dimensional representation of the global distribution of atmospheric CO2 for 2000-2009. The 10-degree latitude band in which Ascension Island resides is highlighted in red. Using the above 2-dimensional matrix, we can construct a zonal average time series for any specified latitude band or extract a time series at a specific latitude. The global mean surface CO2 time series (Figure 6) is created by computing, for each week, the latitude-weighted mean value for the band 90°S to 90°N. 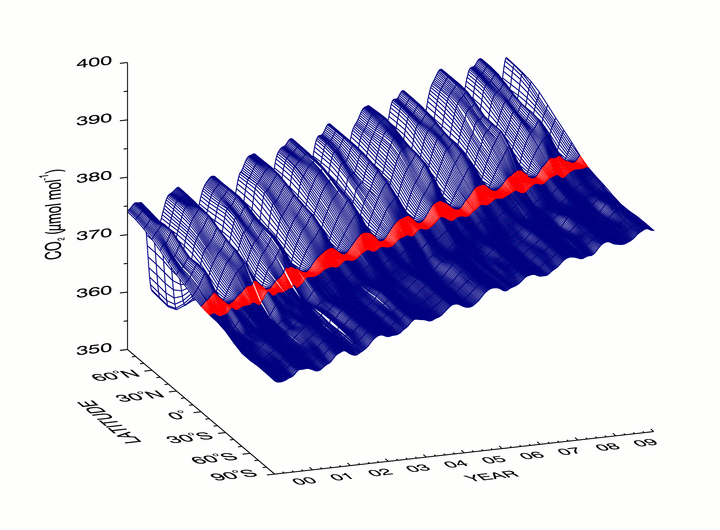 Figure 6: Global mean surface CO2 time series for 2000-2009. The World Meteorological Organization (WMO) World Data Center for Greenhouse Gases (WDCGG) also publishes global averages for CO2 and other gases. WDCGG uses curve fitting and data extension methods very similar to those developed by NOAA [WMO, 2009b], but in addition to marine boundary layer sites, WDCGG includes many continental locations strongly influenced by local biospheric sources and sinks and also by fossil fuel emissions. WDCGG also includes sites from multiple independent laboratories which raises the issue of possible artifacts due to scale or measurements differences. The WDCGG global average has a positive mean offset of ~0.35 ppm and a larger seasonal cycle amplitude compared to NOAA results. The MBL estimate is expected to be lower than a full global surface average because areas with high fossil fuel loading due to recent emissions are not represented. On the other hand, the full troposphere (up to ~8-15 km altitude) and especially the stratosphere with lower CO2 mole fraction are not represented in either approach. We observe that CO2 is increasing at about the same rate everywhere it is measured. Because CO2 is a long lived gas in the atmosphere, emissions anywhere will, in about one year, contribute to higher CO2 everywhere. One cannot “hide” CO2 emissions from the MBL sites for more than about a month. Thus the MBL gives probably the best low-noise representation of the ongoing global increase of CO2. We continue to base our global average on MBL sites because it is not clear how to properly weight continental sites in a global average. Our evidence so far indicates that the NOAA MBL global average is representative, internally consistent and stable over time with respect to the addition of new MBL sites. Conway, T.J., P.P. Tans, L.S. Waterman, K.W. Thoning, D.R. Kitzis, K.A. Masarie, and N. Zhang, 1994, Evidence for interannual variability of the carbon cycle from the NOAA/CMDL global air sampling network, J. Geophys. Res., 99, 22831-22855. Dlugokencky, E.J., L.P. Steele, P.M. Lang, and K.A. Masarie, 1994, The growth rate and distribution of atmospheric methane, J. Geophys. Res., 99, 17,021-17,043. GLOBALVIEW-CO2: Cooperative Atmospheric Data Integration Project - Carbon Dioxide. NOAA ESRL, Boulder, Colorado, 2010. www.esrl.noaa.gov/gmd/ccgg/globalview/co2/co2_intro.html. Masarie, K.A. and P.P. Tans, 1995, Extension and Integration of Atmospheric Carbon Dioxide Data into a Globally Consistent Measurement Record, J. Geophys. Res., .100, 11593-11610. Novelli, P.C., L.P. Steele, and P.P. Tans, 1992, Mixing ratios of carbon monoxide in the troposphere, J. Geophys. Res., 97, 20,731-20,750. Tans, P. P., T. J. Conway and T. Nakazawa, 1989, Latitudinal distribution of the sources and sinks of atmospheric carbon dioxide derived from surface observations and atmospheric transport model, J. of Geophys. Res., 94., 5151-5172. Thoning, K.W., P.P. Tans, and W.D. Komhyr, 1989, Atmospheric carbon dioxide at Mauna Loa Observatory, 2. Analysis of the NOAA/GMCC data, 1974 1985., J. Geophys. Res. ,94, 8549 8565. Trolier, M., J.W.C. White, P.P. Tans, K.A. Masarie and P.A. Gemery, 1996, Monitoring the isotopic composition of atmospheric CO2: measurements from the NOAA Global Air Sampling Network, J. Geophys. Res., 101, 25897-25916. 14th WMO/IAEA Meeting of Experts on Carbon Dioxide Concentration and Related Tracers Measurement Techniques (Helsinki, Finland, 10-13 September 2007) WMO TD No. 1487, April 2009a. Tsutsumi, Y., M. Kazumasa, H. Takatoshi, I. Masaaki and T.J. Conway, Technical Report of Global Analysis Method for Major Greenhouse Gases by the World Data Center for Greenhouse Gases, WMO TD No. 1473, June 2009b.